Do you want to hide the rotting waste that you have after using compost for your garden? Then having a garden composter is essential. 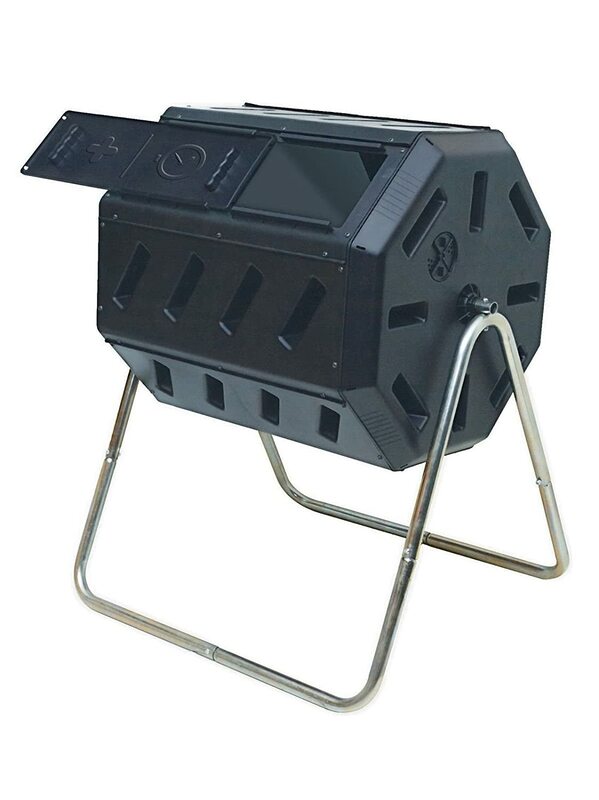 There are a lot of composter in the market today, but knowing the best garden composter will help you decide what you want for you and your garden. They also have different features and knowing what these will help you to choose the best composter that you need. There are a lot of garden composter that can be purchased in the market and the two most popular ones are the garden composter tumbler and bin. 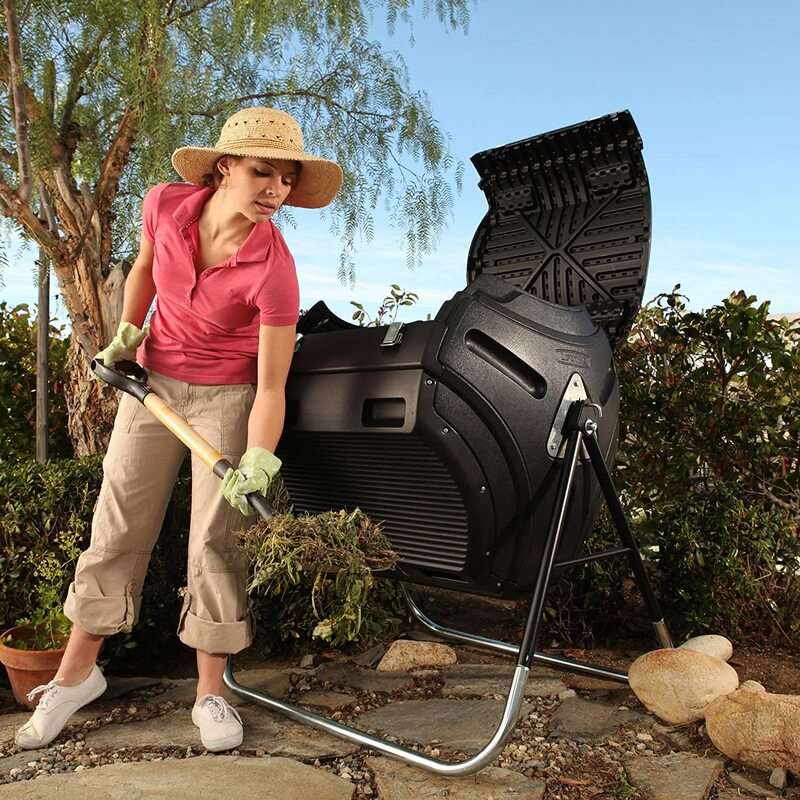 Choosing the right composter for you will help you to do all your composting tasks easier. 2﻿﻿. Good Ideas EZCJR-BLK 7 Cubic Foot Compost Wizard Jr.
A tumbler composter has a shape of a canister that can easily be rolled around to the garden. There are also some types of tumblers that have a drum that is large and rests on the ground. If you prefer to use a composter that is small, then worry no more since there’s a smaller version of it. The only problem when it comes to tumblers is that the materials that are most and fresh can become a heavy and compacted ball. A closed bin composter is covered from different types of elements. This kind of composter can retain the compost’s moisture while discouraging pets. Since it can serve as a protection to your compose, this type of bin can be expensive. An open bin composter is made out of recycled plastics that are light in weight. There are pre-formed holes which are used for ventilation. 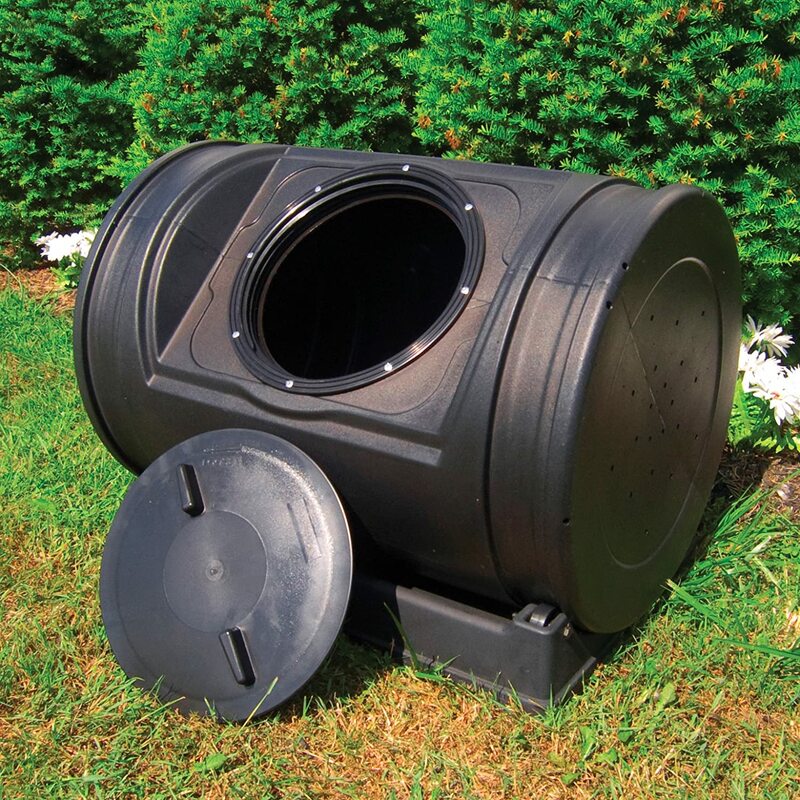 This type of composter is more affordable than the closed bin. These are the different kinds of garden composter to choose from but how can you know the best garden composter for you? Find out how you can choose the best one by reading the information below. The garden composter should consist of tiny holes where the air can freely circulate. The compost inside it should be able to have air to avoid the buildup of bacteria, which will only ruin the compost for your soil. No matter what type of garden composter you choose, you need to make sure that the lid is large enough for you to be able to put every material that you need. It will also help you to take out any compost out if needed. Another thing that you need to think of when buying a composter is that you need to make sure that it is made out of light materials. 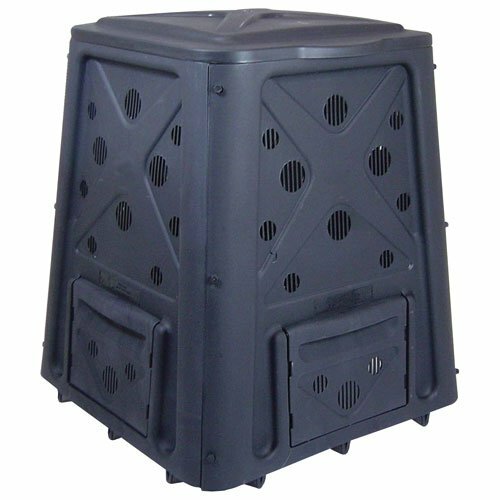 This will help you to carry and more the composter around your garden if needed. Of course, to ensure your compost is free from rodents, you need to make sure that the garden composter that you are going to purchase is rodent resistant. There are instances that rodents get attracted to the compost and ensuring that they won’t be able to get near your compost is essential. Above are the tips on how you can find the best garden composter for your compost. of course, once you get your composter, then it would be best to know how you can successfully do your compost. Below are some of the tips for a successful composting session. The first thing that you need to do is to shred the materials or chop them even before you start the composting process. The reason behind this is because it will help you to do the composting in a rapid manner. This means that you will have more time to do other gardening stuff rather than just composting. You need to ensure that you will provide the compost with the air and water that it needs. The reason behind this is because the compost needs to be moist for it to become healthy. You can tell by the spongy texture of the compost if it’s healthy or not. If the compost smells bad, then this mean that it is not getting enough water and air. You may add dry twigs and leaves for them to absorb the smell. To avoid attracting rodents, it would be best to avoid composting pet waste. You can just bury the waste in garden beds and make sure to cover them with at least 8 inches deep in the soil. You can also just wrap them so you can throw them in the trash.It would also be not ideal to put in kitchen waste in the composter since it will only attract pests and rodents. You can put kitchen waste in food or worm bin if you want. Now, once you are done composting, the next thing that you need to do is to use it to create a soil that is healthy. You can do this by mixing the compost with the soil or use it as a mulch for your garden beds. The first thing that you need to do is to ensure that you know that your compost is a living system. So taking good care of it is essential, for it to produce excellent composts for your garden. It is essential that you keep the materials diversified since it will ensure that the compost will be richer. Another thing that you need to remember is to ensure that the holes in your compost bin or tumbler are all well cleaned. This will help the air to freely rotate inside, which will also make your compost less smelly. To ensure that your compost is well moist, it is essential to maintain the compost bin and tumbler’s ventilation clean. The holes in it should be able to drain the water inside, as soaking the compost in too much water can ruin your overall compost. Lastly, to maintain the quality of your compost bin and tumbler, you need to ensure to never include certain things inside the compost, including metals, meat scraps, dairy, plastic, and weeds. Now that you are ready to do your compost, then the next thing that you need to do is to know the best garden composter available in the market today. In this way, you will know the best garden composter bin and tumbler today. Algreen Products Soil Saver Classic Compost Bin will help you save money since it will contribute to reducing the curbside pickup. The bin will help you produce organic soil that is nutritiously rich for healthier plants in your garden. Algreen includes a self-watering locking lid and is made out of 100% recycled material. The 2 sliding doors that it has will help you to access the compost inside the bin easily. The Algreen compost bin has a robust construction and thickness which will help insulate and produce heat. The heat will then assist the microorganisms to break down and provide the needed nutrients for th﻿﻿e soil. Redmon Green Culture 65-Gallon Compost Bin is a convenient and easy to use composter, wherein it can convert lawn and food waste into compost that is nutritiously rich. 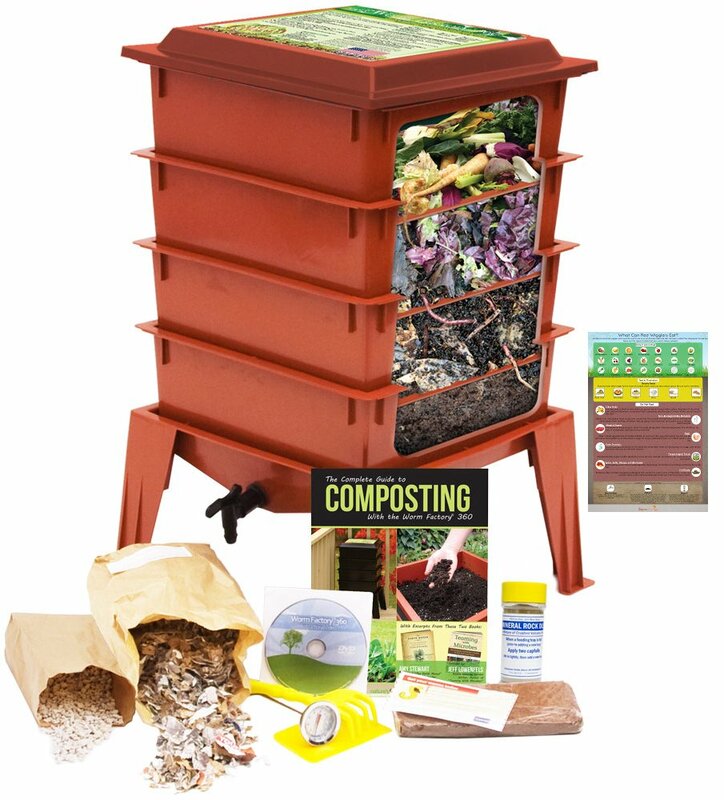 The bin can hold 65 gallons of compost and is made out of rugged plastic resin. The good thing about this composter is that you can just leave it outside and it won’t even start deteriorating. 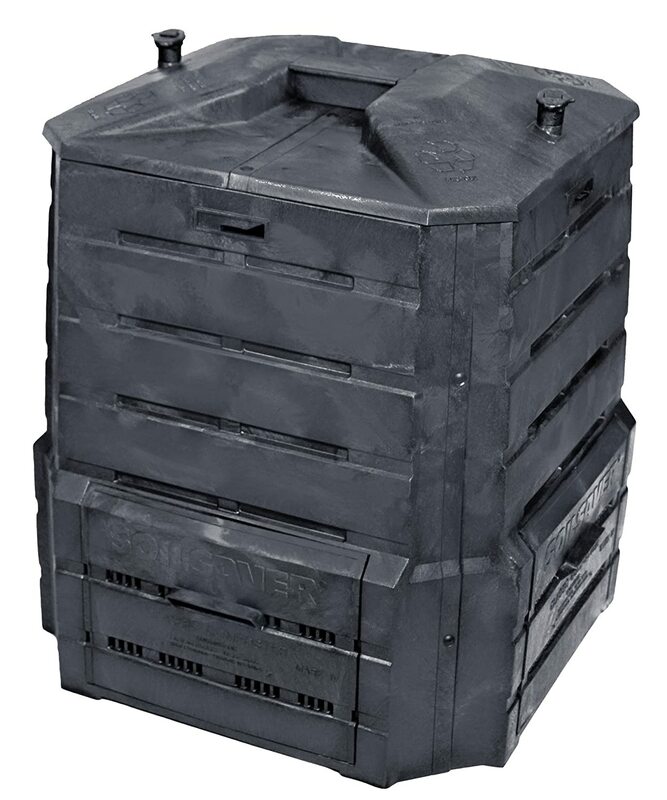 The Redmon Compost Bin is consists of a lid that can be lift-off for you to add substances if needed easily. Another good thing about this commuter is that it has four doors to ensure a more convenient access. It also has holes for a proper ventilation to ensure that your compost will function well. 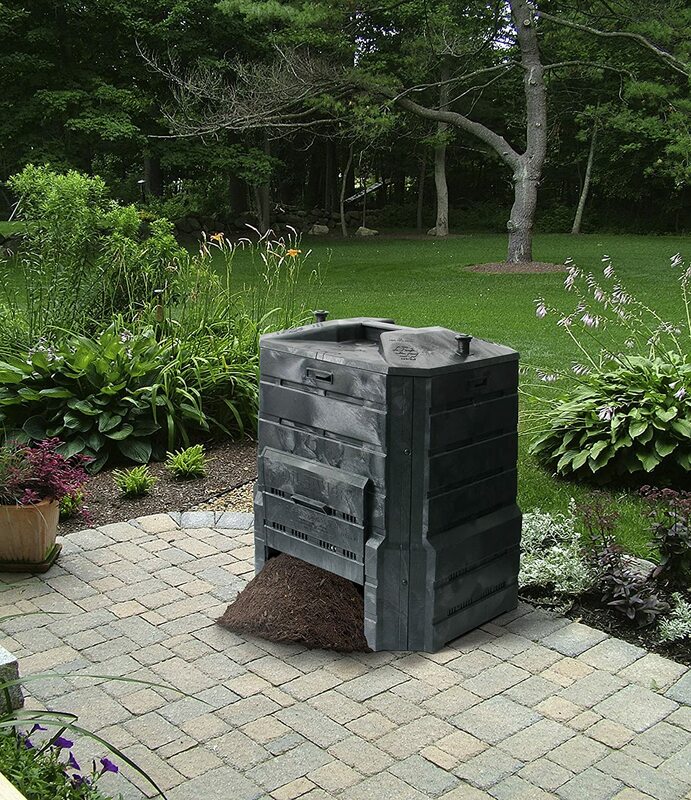 The Redmon compost bin will not only help you create compost but will also reduce the garbage of volume in landfills. 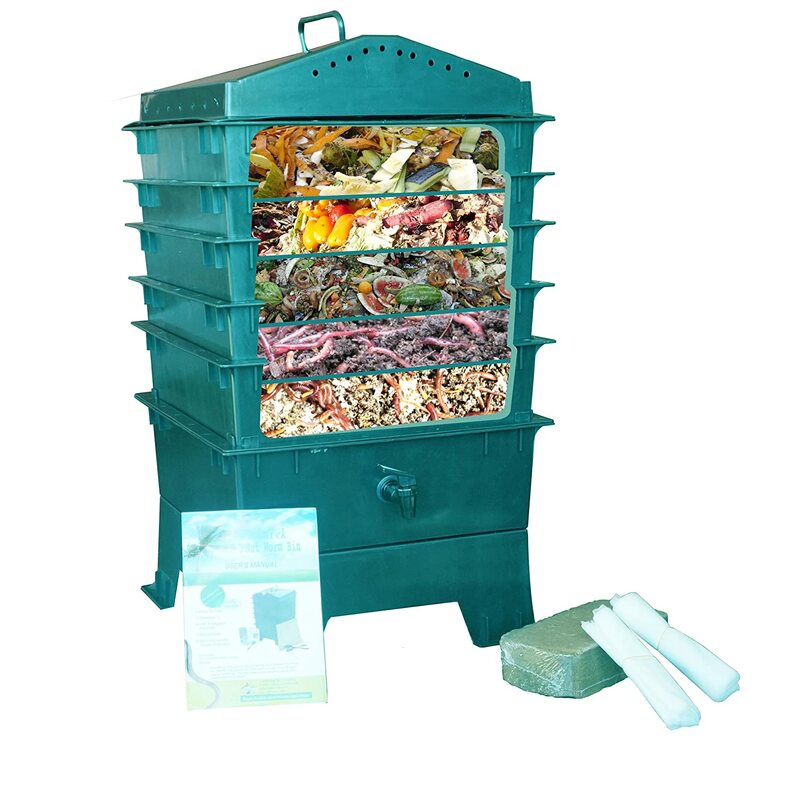 VermiHut 5-Tray Worm Compost Bin is an odorless bin, which means that you can easily use it indoors. People who don’t have a balcony will surely find this bin useful. The VermiHut compost bin is also very affordable, so people who are on a budget won’t have any problems when it comes to purchasing this compost bin. The compost bin is consists of a lid, five trays for stacking, a tray to collect liquid and a base. The cover looks like that of a roof and has holes to provide air to the compost. The spigot that is included in this bin will help yo to quickly collect the worm compost that you made. 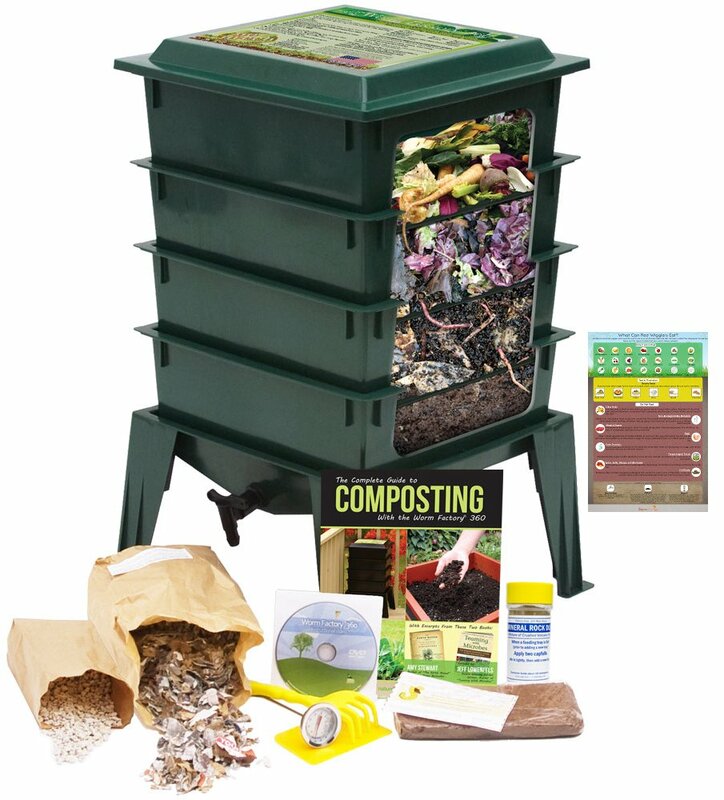 Worm Factory 360 Worm Composting Bin can easily be setup, wherein all you need is 15 minutes of your time every week to create compost. The product comes with a lot of free stuff, for you to be able to follow the instructions and the needed materials to create a compost that is high in quality. This bin can also be expanded through a multi-tray design. The 4 stacking trays are available and can hold up 8 trays. The Worm composting bin is perfect for people with small homes since it can be adjusted when it comes to the capacity that it can hold. For bigger homes, then adding more trays would be ideal. Another good thing about the Worm composter is that you can use it for many years without worrying about its durability. It comes with a 10-year warranty, so you don’t have to worry about anything. The Chapin 63985 backpack sprayer has a padded shoulder for maximum comfort, no matter how long you use it. Another good thing about this is that the tank has a lifetime guarantee, while the other accessories and parts have a one year warranty. Envirocycle Composting Tumbler is considered as one of the most beautiful and reliable compost tumblers in the world of gardening today. This is simply because of the fashionable and sleek design that they have. The material used in this tumbler is BPA free since it is made out of recycled plastic. The Envirocycle will collect the compost tea in its tank, which is located at the base of the tumbler. 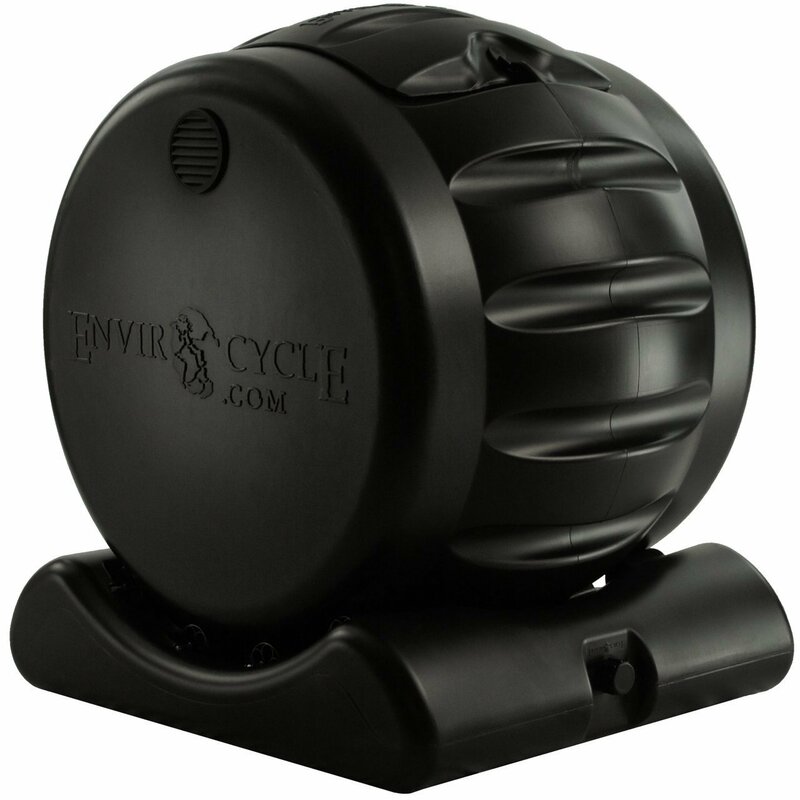 The Envirocycle Composting Tumbler has a capacity of 35 gallons and a snap latch design on its door. The door is made with a design that will seal correctly the lid. Now for you to easily grip it, the external wall have grooves. Another good thing about this tumbler is that it has a big opening, which makes disposal easier. Lastly, the wheel cavities will help the water be trained while the tumbler is rotating. 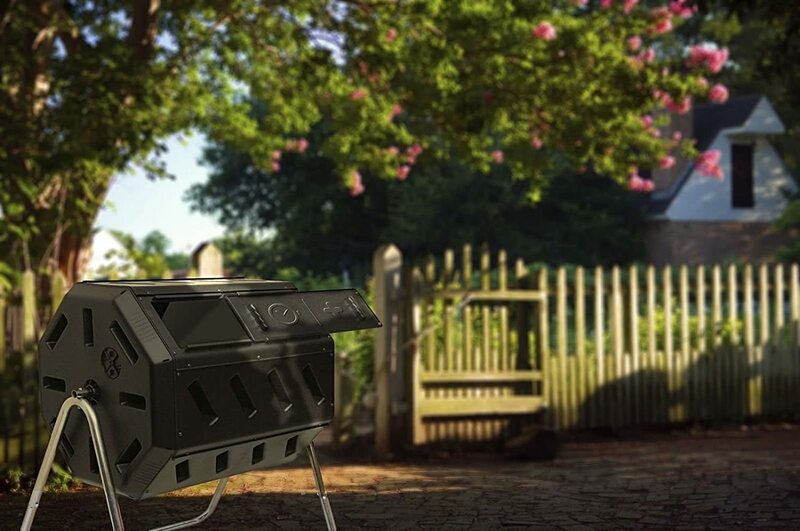 Good Ideas EZCJR-BLK 7 Cubic Foot Compost Wizard Jr. can discretely handle your compost. The lid can be screwed tightly and has a measurement of 12 inches, which will provide a lot of room to access the compost. But once you are done adding or getting compost, then screwing it back is highly important to ensure that animals will be kept away. The Compost Wizard also has handles that will help you to grip the tumbler with ease. The Compost Wizard Jr. is already assembled, which mans that you can use it almost immediately. It is also wheel based, so transporting it from one place to another won’t be a problem. Another good thing about this tumbler is that it is weatherproof, so it doesn’t matter if you stay it outside your home. 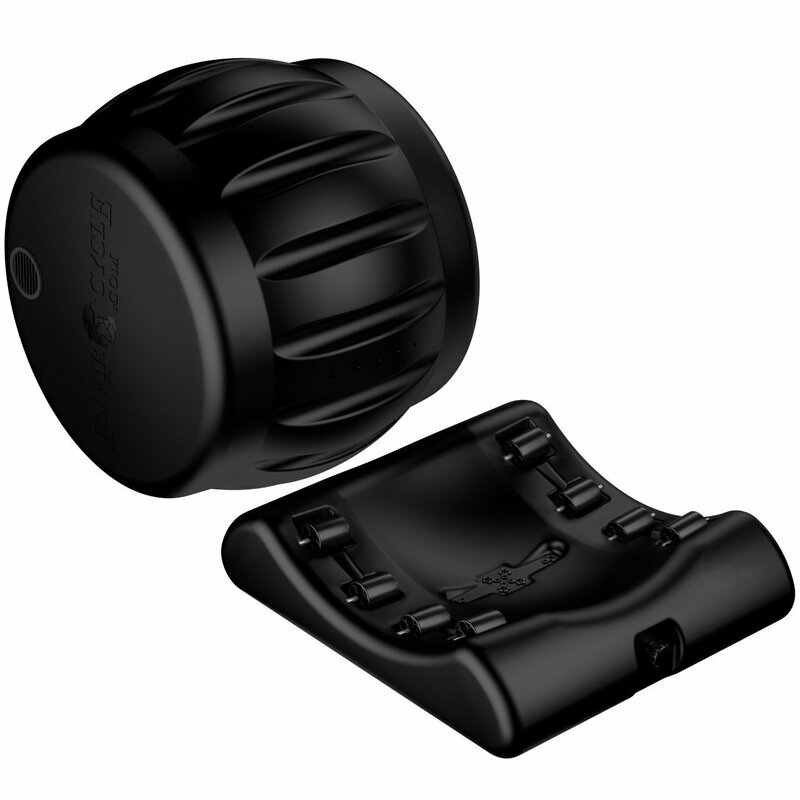 It comes in a black color for ultimate heat absorption. Lastly, the materials are FDA approved and are all made in the USA. Lifetime 60058 Compost Tumbler is 44 inches in height, which makes it convenient for you to load composts. You can also easily access it since you don’t have to slouch down and hurt yourself. You can quickly load it up just by standing up. This tumbler can be rotated easily, which makes it very convenient for people who are looking for this kind of style. 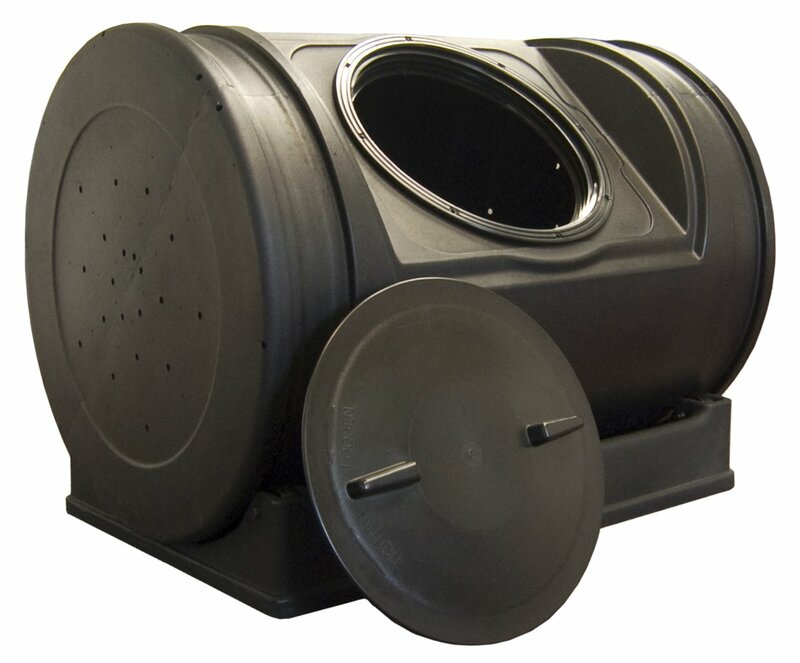 The Lifetime Compost Tumbler has a capacity of 869 cubic feet or 65 gallons. The Lifetime 60058 Compost Tumbler is made out of plastic materials that are high-density polyethylene for maximum durability. It is built with panels that are double-walled to ensure that it will preserve and absorb the heat that will decompose the pile. There is also a better flow of air due to the internal bar that the compost tumbler has. Another good thing about this compost tumbler is that the lid can be removed for you to access the compost inside easily. It can also be closed using the latched to ensure that the rodents will be kept out. Yimby Tumbler Composter will help you avoid mixing and digging your compost using your bare hands just because the tumbling is designed to make mixing efficient and easy. All you have to do is close the door and start turning it 5 to 6 ties every 3 days. During the hot weather condition and with balanced ingredients, the compost will be ready in less than 2 weeks. 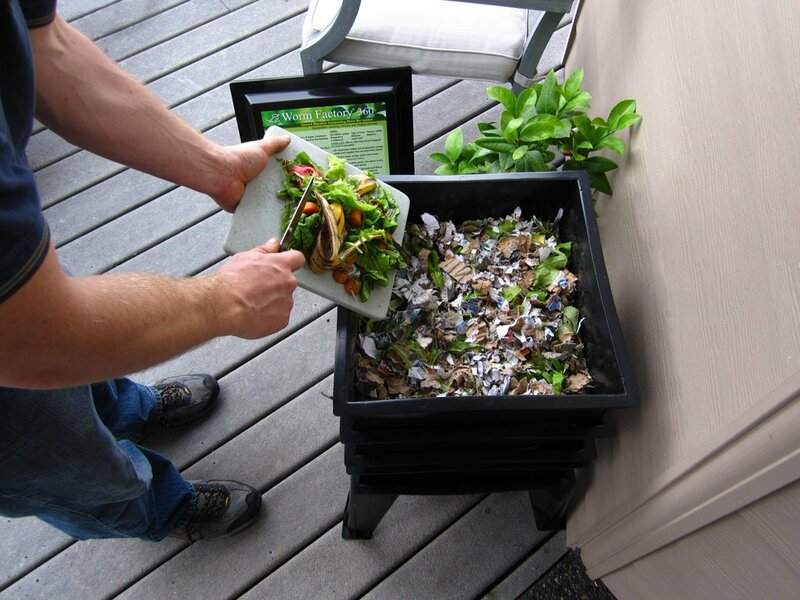 The Yimby composter is consists of 2 chambers, which will let you finish cooking the other side while making the other side available to add clippings and scraps that are fresh. The Yimby Tumbler Composter is made out of BPA-free material, and a recycled UV inhibited polypropylene, which makes it contact safe and won’t deteriorate under the sunlight. The steel frame is also resistant from corrosion. Another good thing about the Yimby composter is that it has an excellent aeration, wherein you can easily adjust the air vents. 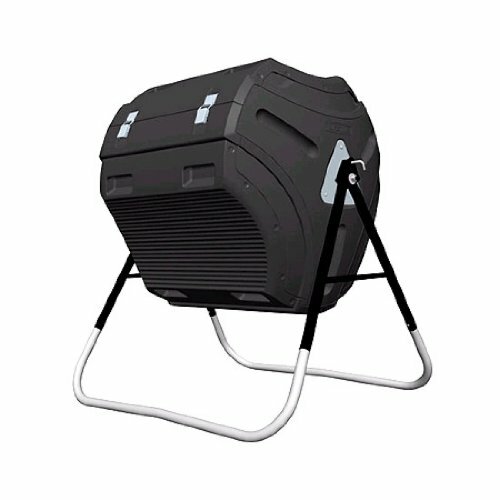 This will help provide all the needed oxygen for your compost to be created successfully. These are the best garden compost bins and tumblers available in the market today. Of course, for every review, there will always be one that will stand out, and for the best garden compost bin, the winner would be the Algreen Products Soil Saver Classic Compost Bin. The reason behind it is because it can produce rich and organic dark compost in as little as 8 weeks. This means that you can feed your soil for it to be ready for planting. Its construction is robust which will insulate the heat to help the breakdown of the micro-organism waste to produce the needed nutrients for your soil. Now, for the best garden compost tumbler, the hailed winner is the Envirocycle Composting Tumbler and Compost Tea Maker. The reason behind this besides it being a gorgeous composter it that it can produce liquid and solid compost. The materials are antioxidant and UV protected and are known to be rust free. You also don’t have to worry about assembling it since it is already assembled. Lastly, it comes with a 5 year limited warranty, so you don’t have to worry about it getting maintained. Everything that you need to know about composting are included above, and all you have to do is to look for the best that will suit your needs. Whether you choose a bin or a tumbler, the most important thing that you need to do is to choose the one that will help you with all your compost needs. Also, don’t forget to clean and maintain your compost bin or tumbler regularly, to ensure that it will last long and serve its primary purpose for you and your soil. Start choosing the best garden composter now for you to start creating your compost and start feeding your soil with all the nutrients that it needs to be healthy. This will also make sure that whatever plant you grow in your garden will grow healthily and successfully, since your soil is packed with all the right nutrients.